Bintulu Port Holdings Berhad is an investment holding company. The Company operates in two segments: Port operations and Bulking services. The Port operations segment is engaged in port services and construction services, including construction of port facilities, handling of cargo for liquefied natural gas, petroleum products, liquefied petroleum gas, general cargo, container, dry bulk cargo and other ancillary services. The Bulking services segment provides bulking installation facilities for palm oil, edible oils, vegetable oils, fats and its by-products. Its subsidiaries include Bintulu Port Sdn. Bhd., which is engaged in the provision of port services at Bintulu Port, Sarawak; Biport Bulkers Sdn. Bhd., which is engaged in the provision of bulking installation facilities for palm oil, edible oils, vegetables oils, fats and its by-products, and Samalaju Industrial Port Sdn. Bhd., which is engaged in the development and provision of port services at Samalaju Port, Bintulu, Sarawak. Bintulu Port Holdings Berhad is inviting highly motivated self-driven Malaysians to apply for the following challenging position to be based in Bintulu, Sarawak. Preference would be given to candidates residing in Sarawak. 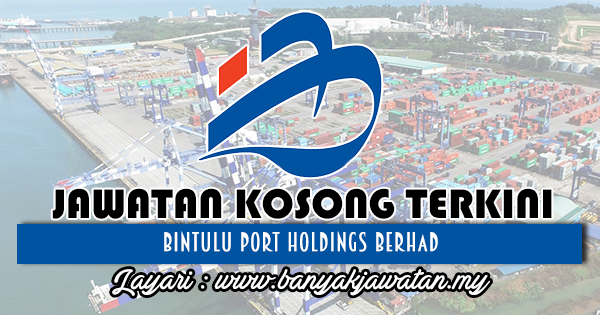 0 Response to "Jawatan Kosong di Bintulu Port Holdings Berhad - 8 Disember 2018"